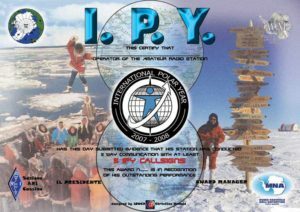 Designed by Christine, IØOCD, this Award was issued by ARI Cassino to join the International celebrations of the 5th International Polar Year. 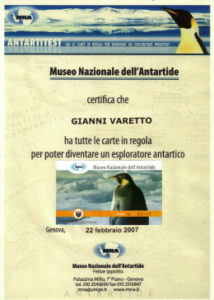 Certificate issued by MNA (Museo Nazionale dell’Antartide) National Antarctic Museum to the visitors. This Award is NOT managed by WAP Staff. The DBase used by the Manager of this Award (IØOCD mail i0ocd.chris@alice.it ), is the same WAP DBase used for all WAP Awards. Rules and application form for this Award are available by IØOCD Christine. Get in touch with her before sending your application. 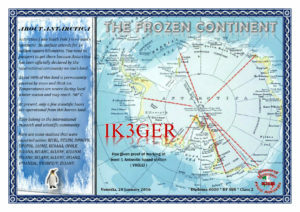 The “THE FROZEN CONTINENT” award issued in 2 classes is available OM/SWL who will be able to satisfy the conditions provided for class 1 or class 2. 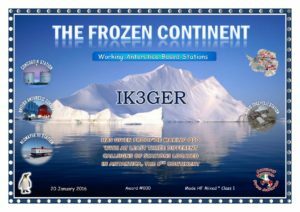 At least 1 QSO/HRD with a station based in Antarctica. 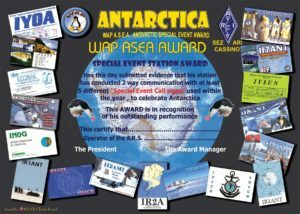 Don’t forget that Stations from the Falklands, South Georgia, South Orkney, South Shetlands and other Antarctic islands are not valid for the purpose of this award. QSO/HRD validity 1.1.1985. Endorsement may by requested for SSB, CW, MIXED, DIGI etc. It is mandatory to send to the manager photocopy or scan of the QSL cards of the Antarctic stations only. Just send your application by email to the award manager IK3GER and you will get the Award right away.